* Why recruits in Arab terrorist training camps say "Heil Hitler"
Doesn't everyone wish to better understand the great terrorist threat facing Western civilization? 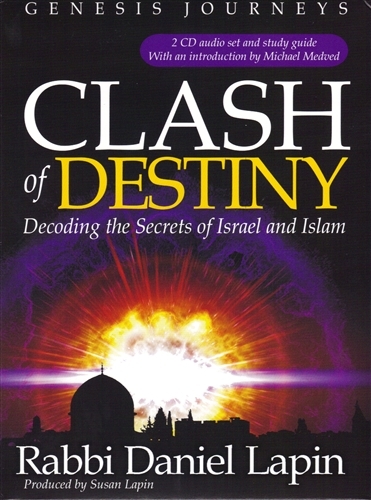 Spurred by the conviction that the Bible is a blueprint to the future as well as a depiction of the past, Rabbi Daniel Lapin exposes the Biblical roots of today's deadly Middle East conflict. He explores Hebrew clues in Biblical texts, explaining how the blessings and choices of Abraham and his sons, Isaac and Ishmael, continue to impact tomorrow's news headlines. 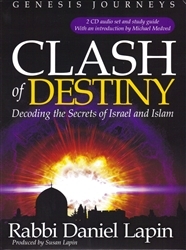 You will be astounded as this teaching leaps from verses in Genesis to events in the book of Samuel and into veiled clues in the scroll of Esther, tracing personality traits and characteristics that re-appear generation after generation. Current events will make more sense against the backdrop of the Bible. As always, Rabbi Lapin's humor and eloquence will entertain and inspire you as he delves beneath the surface of the Bible's description of Sarah's handmaiden, Hagar, of Ishmael's children and of Isaac's blessing to Jacob. You will examine the role that laughter and music have in controlling our emotions and find strength in realizing that whether our heritage is noble or notorious, we each have the obligation and opportunity to mold our own lives. Discover how pivotal interactions that took place thousands of years ago are still echoing in our own time. You will be strengthened in your own faith as you understand more about the convictions of those who wish to eradicate all remnants of that faith. In these dangerous times, let the Bible be your guide.